Let's say you're a filmmaker shooting a documentary in New York City. You wander through Times Square, through museums, through other destinations, letting your camera roll along the way. Only later do you wonder: Do I need to clear the copyright on the Andy Warhol and Jackson Pollock paintings that came into my camera's field of view when I was shooting at the MoMA? Or do I need to get clearance on a Miles Davis song that a busker, caught on film, happened to be playing? Those are the difficult kinds of questions that filmmakers face, and they get sorted out in a pretty unique comic book written by Keith Aoki, James Boyle and, Jennifer Jenkins. 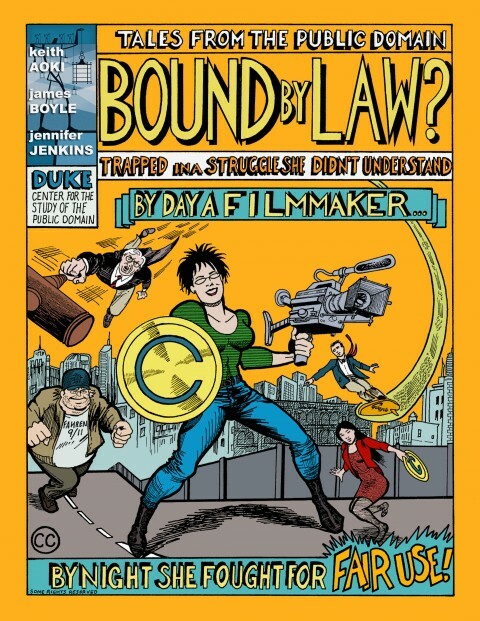 Sponsored by Duke's Center for the Study of the Public Domain, the comic is called Bound By Law? (Tales from the Public Domain). And it's available as a free PDF file (8mb - 16mb), in html format, and also as a flash animation. There are also translations in Portuguese, French, and Italian. And wait, there's more: the comic comes with a Foreword by Oscar-winning filmmaker Davis Guggenheim, and an Introduction by BoingBoing blogger Cory Doctorow, who calls Bound by Law? not just "a treatise on copyright," but also "a loving tribute to the form of comics." Bound By Law? -- which has been released under a Creative Commons license -- will be added to our collection, 800 Free eBooks for iPad, Kindle & Other Devices. Harvard also has a MOOC on Copyright -- one of 260 MOOCS getting started in January 2015.